We offer embroidery options for most products that we sell. In order to personalize an item, please be sure to select the appropriate embroidery options on the listing page you are interested in purchasing (before adding to cart). 1. Select your item color combination and quantity of each color only if you are mixing colors. 2. 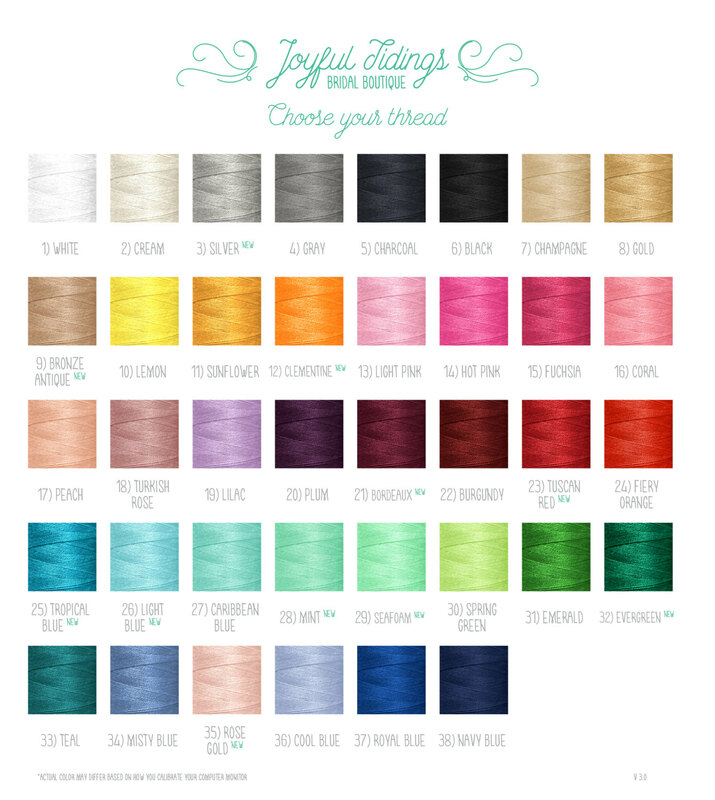 Select your embroidery thread color. Find our list of embroidery thread colors here. 4. Select your embroidery location (if applicable). Due to the nature of personalized products, delivery time = production time + shipping transit time. Our current production time is around four to five weeks, and shipping time is around three to five business days. If you need your order before then, we offer a rush option for $75, found here. Yes, we offer a rush service with which we will ship out your order within one week. Please find the rush listing here. Note: the rush add-on will not expedite shipping transit time. Please contact us for an expedited shipping quote. What are some things to watch out for before placing my order? 2) Your robe will be embroidered in the exact order and casing of letters you provide. I.e. “Bridesmaid” is different from “bridesmaid” or “BRIDESMAID”, please check to see if the letters are in their desired cases. 3) Please let us know if you need the order rushed as soon as possible (see below). Rush production time begins at the time we receive the rush instruction. What is a monogram? Are there any rules? A monogram is a three to four lettered ornament that arranges one’s initials in a particular way. Monograms are traditionally in the order of first initial, LAST initial, and middle initial. The initial of the last name is placed in the middle of the monogram and made larger. If your name is Allison Lee Weston, your monogram would be AWL. 2) in new, unused, unwashed condition. If we make a mistake in shipping or personalizing your order, we will fix it at no cost to you. No personalized items can be returned, so please be sure to double check an order before you place it. We do not accept refunds for “rush order” or “back embroidery” add-ons once the item has been shipped or embroidered, respectively. Put differently, once the work has been completed, we can no longer issue a refund, so please be certain before you place your order.